It's summertime! Many of you may be participating in a lot of outdoor activities like cookouts, gardening, hanging out poolside, and more. We went through the catastrophic floods here in SC last year. It left behind so much damage and some people are still trying to recover. One thing the floods caused is a serious mosquito problem. We already have enough of them in SC, but now we have triple the amount. We can't be outside for long before someone gets bit. I don't always want to wear repellent on my skin and am always looking for alternate ways to keep those pesky blood suckers away. 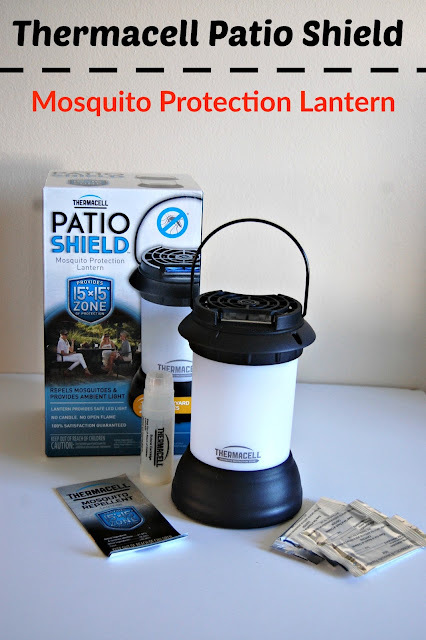 I received the Patio Shield Mosquito Protection Lantern to test out for myself. It comes with 1 butane cartridge, 3 repellent mats, and of course 1 LED lantern. It requires 3 AAA batteries that are not included. Just as the video instructed, you simply insert batteries, the butane cartridge, and a repellent mat in the slot. 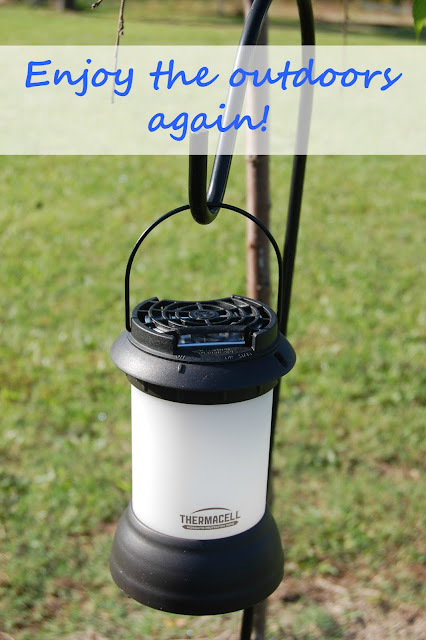 Turn it on and get ready for your outdoor fun! It provides a 15'x15' zone of protection. My son loves to refer to it as his very own force field. Does it actually work? Let me tell you, if there are 1,000 people and one single mosquito, it will find its way to eat me up. My Thermacell lantern keeps them away! I sat out in my back yard recently for one hour and I was able to go inside completely untouched by mosquitoes and biting flies. Now we can say goodbye to the candles that do not work and say hello to Thermacell. This makes me so happy that I don't have to hide inside anymore. Thank you Thermacell for providing me with a review unit. All opinions are my own as always and I simply love this product! I need to pick up a few of these for myself and my mom. The mosquitoes down here in the Carolinas are no joke! Definitely makes playing and entertaining outside hard.